This is a follow-up report to the live demonstration of prostate ultrasound and biopsy that was performed at PCRI conference on September 7, 2013. Biopsy: Due to the strong possibility of the cancer extension out towards the neurovascular bundle and the main tumor volume appears much larger than the original biopsy report, a limited targeted and staging biopsy was performed. Biopsy Report: The report showed Gleason 7=3+4 at the left base, mid and extending towards the apex. Up to 64% of the tissue cores showed the cancer compared to 30% by the initial biopsy. In addition, the left neurovascular bundle was also positive for the cancer extension (sign of ECE). However, the left seminal vesicle was negative for cancer extension. A small volume Gleason 6 cancer was seen at the right mid gland (dotted arrow) as on the initial biopsy. Assessment: Due to the confirmation of ECE (neurovascular bundle invasion confirmed), it is now T3a stage malignancy. With Gleason grade 7, more than 50% tissue core invasion in one of the specimen, and significant degree of blood supply at the cancer (neovascularity) site, this cancer is not a low risk disease. It is an intermediate to high risk disease. Active surveillance is not an option for him, especially at age of 58. He should seriously consider a proper loco-regional therapy. 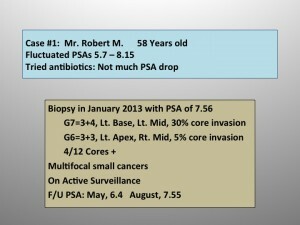 Biopsy: His initial biopsy was systemic blind biopsy, taking two tissue cores from right and left bases, right and left mid and right and left apices of the prostate, all together 12 cores taken. This ultrasound clearly depicts a lesion at the right mid towards the apex. There is a good possibility that this lesion was not recognized and was not biopsied initially. Tissue specimens were obtained from the both bases due to the known cancer in these regions, even though it was not visible on ultrasound. 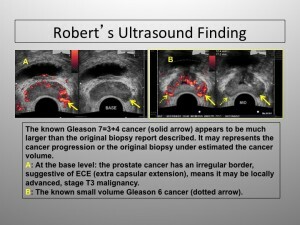 Proper targeted tissue cores were obtained from the lesion at the mid to apex of the prostate since it most likely the main tumor, the “Index” tumor. 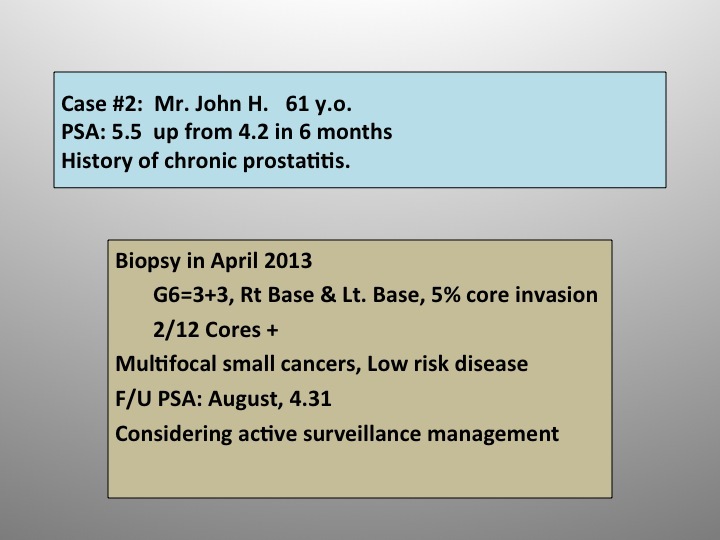 Biopsy report: This biopsy was not able to duplicate the known small volume cancers at both bases of the prostate that is known as Gleason 6 malignancies (<5% invasion). These must be too small to be seen and compatible with clinically insignificant “latent” malignancies. 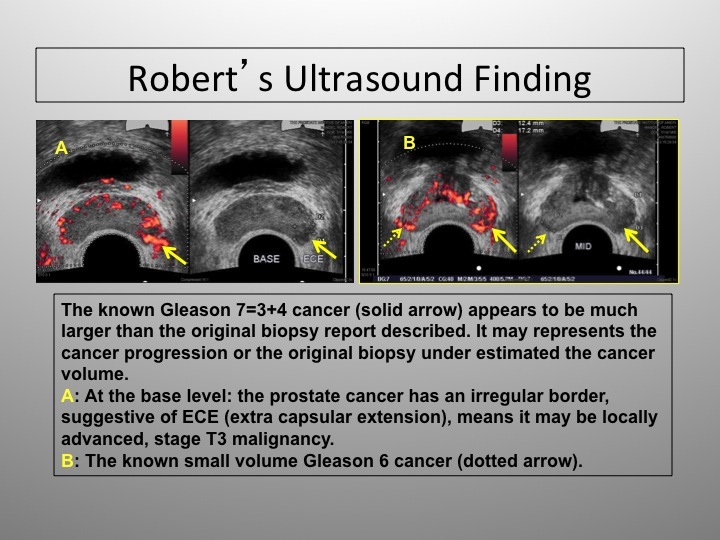 However, the lesion seen on this ultrasound study was a Gleason grade 6 cancer with 20% tissue core invasion, means it is much larger cancer than other two known cancers. It is indeed the “index tumor”. Assessment: This index tumor was missed by the systemic blind biopsy. The index tumor is fortunately Gleason grade 6 and not a large volume (20%). 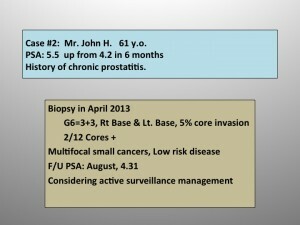 Combining two sets of biopsy reports, it is a pathological T2c, but clinical T1c stage disease. His cancer belongs to low-intermediate risk group. He can consider active surveillance management, at least, for the time being. In that case, he needs a close PSA watch every three month and repeat ultrasound in 6 month. 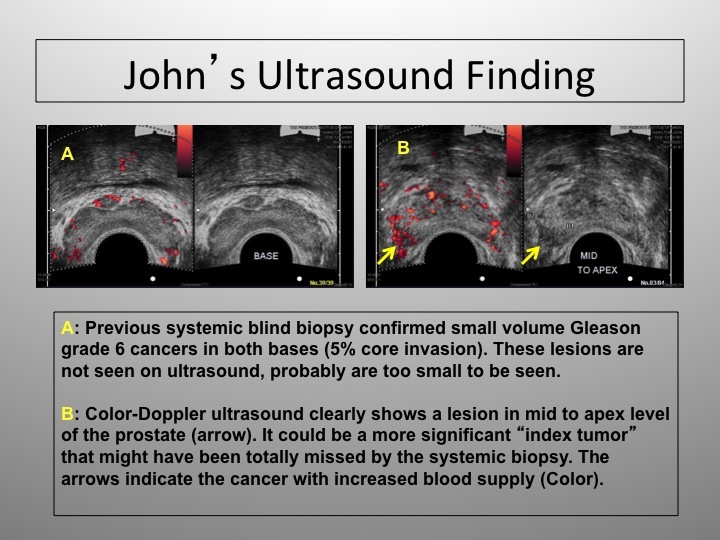 By doing so, we can clearly view the PSA trend and more importantly the known index tumor can be monitored objectively with color-Doppler ultrasound. If there is no evidence of disease progression, he can stay on active surveillance. If not, he should consider a proper loco-regional treatment. These two cases illustrate the importance of proper ultrasound evaluation and targeted staging biopsy. Without correct cancer grade and staging information, it would be almost impossible to make an appropriate management decision. Dr. Bahn was interviewed for the Ask Dr. Myers blog on the topic of Color-Doppler ultrasound of the prostate. The interview can be found here. A reader shared the following comment about Dr. Bahn in response to that interview. Dr. Bahn was also separately interviewed on the topic of Cryotheraphy for Dr. Myers’ newsletter. That interview can be found here. Antibiotics are the most important and main component in my medication treatment mixture. Infections caused by gram negative bacteria is the most common cause of bacterial prostatitis/urinary tract infection. As a result, I have used Fluoroquinolone and Gentamicin as the main antibiotic modalities for a long period of time with variable clinical success. It became apparent that most of my patients have been exposed to Fluoroquinolones for extended period of time before they came to get treatment here. Easy access, oral formulary, and broad-spectrum coverage have led to widespread and improper use of Fluoroquinolones. Subsequently, resistance against Fluoroquinolones have developed worldwide. About a year ago, I replaced Fluoroquinolone (Levofloxacin) with Cephalosporin (Ceftriaxone) in my treatment mixutre. Ceftriaxone is a broad-spectrum antibiotic, and has less chance of overuse and improper use since it can be administered only intramuscularly or intravenously. It is my personal experience to notice slightly better response clinically. However, recent publications have reported increased prevalence of bacteria that contain enzymes known as extended-spectrum beta-lactamase (ESBL) that confer resistance to most antibiotics, particularly antibiotics from the penicillin, cephalosporin, and monobactam families. Furthermore, ESBL organisms often exhibit concurrent resistance against Fluoroquinolones and Cotrimoxazoles (Bactrim). Infections with ESBL-producing organisms have been associated with poor outcome. ESBLs have been found exclusively in gram-negative organisms, particularly Escherichia coli and Klebsiella, but also in Acinetobacter, Enterobacter, Proteus, Pseudomonas, Salmonella, and Shigella. Community and hospital-acquired ESBL-producing gram negative bacteria are prevalent worldwide. Antibiotics from the Carbapenem family are the best anti-microbial agents to treat infections caused by such organisms. Based on these updated information and my experience, I have revised my treatment cocktail. It is now consisted of a mixture of Carbapenem antibiotic, Aminoglycoside antibiotic, anti-anaerobe/anti-protozoa antibiotic, and anti-fungal agents. Corticosteroid is also added to the mixture in case the underlying etiology is an auto-immune reaction. The treatment mixture also contains Lidocaine and Ketorolac for pain control. This medication treatment mixture is directly infiltrated into the prostate and seminal vesicles under precise transrectal ultrasound guidance. Dr. Bahn will perform prostate ultrasound and biopsy at PCRI (www.pcri.org) conference that will be held at Marriott Hotel (LAX) on September 6-8, 2013. It will be a live demonstration on stage, in front of audience. This live demonstration will help to understand the nature of prostate cancer that will lead to proper management and treatment. This is an unique prostate cancer conference that is designed for general public. It usually attracts more than 700 people every year. Many attendees came from foreign countries. It is strongly recommended to attend this meeting, especially if you were diagnosed with prostate cancer or you have a high risk to have prostate cancer. Last month Dr. Duke Bahn invited me to meet him for lunch on the Malibu coast to interview Ryan O’Neal (Love Story, Paper Moon) and to discuss, of all things, focal cryotherapy. It was a beautiful summer day to be at an enjoyable restaurant off the Coast Highway overlooking the ocean. Mr. O’Neal underwent treatment for prostate cancer last year. His treatment turned out favorably so he generously offered to tell his story. My social life is normally limited to everyday folks so I was naturally curious about meeting Mr. O’Neal. When I arrived at the restaurant he was already seated in the waiting area. He sprang to his feet offering a warm smile and handshake. We made our way to the table where we were joined by Dr. Bahn and Ryan’s friend Greg Hodal. Ryan was diagnosed with stage T2b (medium sized nodule) and Gleason Grade 7 (Intermediate Grade) prostate cancer in 2012 when his doctor felt an abnormality on digital rectal examination. Mr. O’Neal related that he had faced the diagnosis of serious cancer before. When he was sixty, twelve years ago, he was diagnosed with chronic myelogenous leukemia (CML). Ryan was very curious about the controversy surrounding PSA screening and posed a number of insightful questions. Before the meeting I was expecting a jaded Hollywood road warrior. As it turns out, Ryan is extremely personable, a delightfully engaging conversationalist. He was very attentive, asking incisive questions of Dr. Bahn and me about the PCRI and the prostate cancer world in general. While Ryan ate Ahi tuna and I nibbled on Chilean sea bass we covered a wide variety of important themes including the overtreatment of innocuous prostate cancer, the five shades of prostate cancer and the modern potential for reducing side effects using focal therapy, now that scanning technology has been improved. I asked Ryan how he could afford time away from his busy lifestyle to address a mundane subject like prostate cancer. Driving back on the Coast Highway from Malibu to my office in Marina del Rey I was reflecting on Ryan’s playful charm and how he kept steering the conversation back toward Dr. Bahn’s and my comfort zone, the topic of prostate cancer. We all had a great time. No wonder people’s ears perk up when they hear the name—Ryan O’Neal. It was another successful PCRI conference. Dr. Bahn’s topic at this conference was “Active Surveillance and Focal therapy options for early stage prostate cancer”. Dr. Bahn’s paper on focal cryotherapy has been published in the European Urology Journal’s March 2012 issue. European Urology Journal is one of the most prestigious Journal in this field. Dr. Bahn will be featured as a speaker at PCRI conference which will be held on September 7 – 9. He has been a speaker at the conference for 9 years in a row. Please find the details on line (www.pcri.org). Dr. Bahn received a gold award for his cryoimmunotherapy presentation which he gave at the International Society of Cryosurgery held in Trieste, Italy in September, 2011.